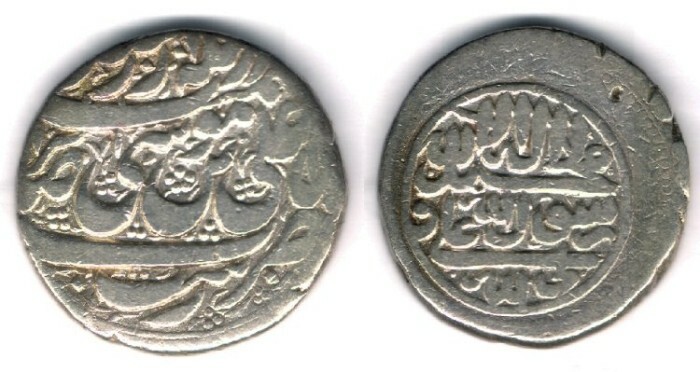 Obverse: The couplet: "be-zar sekkeh as meymant zad qaza/ be-nam-e Ali ebn-e Musa al-reza" with clear mint and date. Notes: Muhammad Hassan Khan Qajar was the head of Qajar family who was killed by Karim Khan Zand for being on the wrong side in a battle in the North of Iran. Agha Muhammad Khan, Muhammad Hassan Khan's son finally overthrown the Zand dynasty in the south of Iran and became the first Shah of Qajar. Even though Muhammad Hassan Khan never was a king, but he minted coins during his lifetime.